In the second quarter, Troy up 6-0, Joe Casale looks to Dev Holmes, who breaks a couple tackles and goes 58 yards for the score. Troy with a 14-0 lead. Fifteen seconds left in the half, it’s a one-score game, and Casale fires to Holmes for another touchdown. Flying Horses with a 20-7 lead at the half. Third quarter, more from Troy, as Joe Casale has to scramble and dumps it off to Joey Ward. He powers his way in for the score and Troy takes a 28-7 lead. Lancaster makes it a game in the fourth, as Ryan Mansell airs it out and connects with Kyle Backert on a 73-yard touchdown. 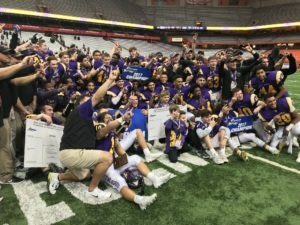 Members of the Troy High School varsity football team were sent off in style Sunday morning as they took the final step in defending their state championship.